Photo by Ian Foss. Licensed via Creative Commons. 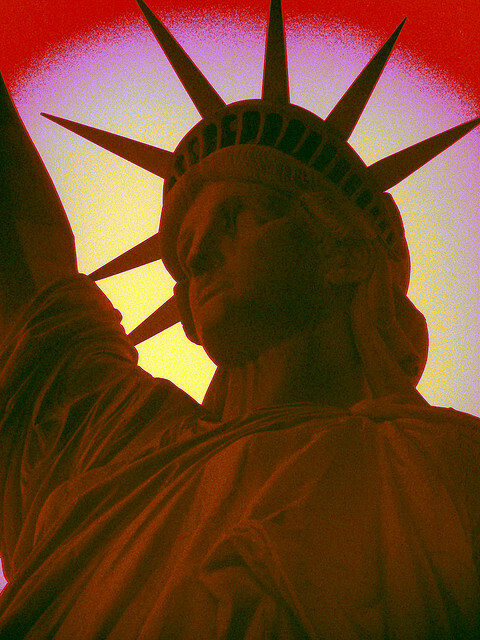 One hundred and twenty-five years ago today, on October 28, 1886, the Statue of Liberty was unveiled to the public. Emma Lazarus' sonnet "The New Colossus," a short poem about the Statue of Liberty that is now installed on its pedestal, was written in 1883 as a donation to one of the many private fundraisers for the construction of the Statue of Liberty. Among those solicited for donations were Chinese-Americans. It is quite a contradiction of history that the Statue of Liberty was brought to New York Harbor right after Congress passed a significant anti-immigrant law, the Chinese Exclusion Act of 1882, which pretty much closed the door on legal Chinese immigration, even after they contributed so much to the construction of the American West. The poetic anthem of an American welcome in "Colossus", and the heartfelt letter of American resident Saum Song Bo who has been denied that welcome - echo forward to the modern day. In the 21st century, we have American residents living among us for years who are still denied integration and immigration status. These two texts from over 125 years ago are as important today as they were then - they call us to be the America that really does live out its physical and spoken reverence for Liberty. And for justice. For all. Both "The New Colossus" and Saum Song Bo's letter are reproduced in their entirety, below. SIR: A paper was presented to me yesterday for inspection, and I found it to be specially drawn up for subscription among my countrymen toward the Pedestal Fund of the Bartholdi Statue of Liberty. Seeing that the heading is an appeal to American citizens, to their love of country and liberty, I feel that my countrymen and myself are honored in being thus appealed to as citizens in the cause of liberty. But the word liberty makes me think of the fact that this country is the land of liberty for men of all nations except the Chinese. I consider it as an insult to us Chinese to call on us to contribute toward building in this land a pedestal for a statue of Liberty. That statue represents Liberty holding a torch which lights the passage of those of all nations who come Into this country. But are the Chinese allowed to come? As for the Chinese who are here, are they allowed to enjoy liberty as men of all other nationalities enjoy it? Are they allowed to go about everywhere free from the insults, abuse, assaults, wrongs and injuries from which men of other nationalities are free? If there be a Chinaman who came to this country when a lad, who has passed through an American institution of learning of the highest grade, who has so fallen in love with American manners and ideas that he desires to make his home in this land, and who, seeing that his countrymen demand one of their own number to be their legal adviser, representative, advocate and protector, desires to study law, can he be a lawyer? By the law of this nation, he, being a Chinaman, cannot become a citizen, and consequently cannot be a lawyer. And this statue of Liberty is a gift to a people from another people who do not love or value liberty for the Chinese. Are not the Annamese and Tonquinese Chinese, to whom liberty is as dear as to the French? What right have the French to deprive them of their liberty?